I find harddrive docking stations too bulky, slow, and unreliable. They are (1) inconvenient to carry when travelling light with a laptop, (2) offer relatively little throughput because the USB ones are limited to 480Mbps and the eSATA ones are often internally bottlenecked to 1.5Gbps due to the bridge chips they use (nevermind that none support SATA 6Gbps), and (3) are not reliable/act in strange ways when a drive is failing, which is sometimes the reason I put the drive in a docking station —to investigate it— and I wonder if it is the station or the drive that is failing. Before I started this project, I knew that a SATA power cable theoretically supplies 3 voltages: 3.3V, 5V, and 12V, but that no drive on the market uses/needs 3.3V. I started by disassembling my Rosewill RX-DUS100 docking station to reverse-engineer the design and find how it was supplying 12V and 5V to the drive. 12V came directly from the output of the wall adapter whereas 5V came from the output of a chip labelled Techcode TD1509 which I quickly found out was, with 2 capacitors, a diode, and an inductor nearby, forming a circuit called a PWM buck DC/DC converter. I must ashamedly admit I had never heard of buck converters before (hey, electronics is a hobby I rarely practice!) 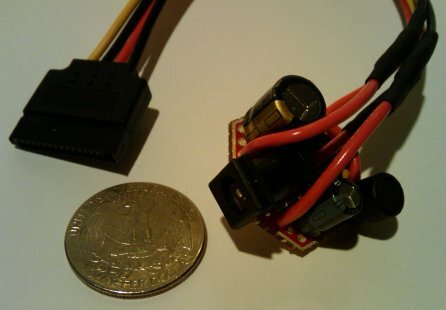 Now armed with the key piece of information I needed, I decided my plan will be to re-use the 12V wall adapter from the docking station, and to build a buck converter on a PCB as small as possible with a DC power jack as the input and a SATA power cable as the output. I measured the current draw at 12V and 5V on a handful of harddrives and cross-checked with the HDD vendors' datasheets. Drives are never rated more than about 2.5A @ 12V and 0.7A @ 5V. In practice my measurements showed no more than 1.5A @ 12V and 0.6A @ 5V. Power consumption on the 5V rail is pretty much constant, whereas 12V spikes to ~1.5A during spin-up then falls back to ~0.5A. As to my docking station, its 12V wall adapter is rated 2A, and its Techcode TD1509 converter is rated 2A @ 5V (overspec'd because it powers a few other chips in addition to the drive.) 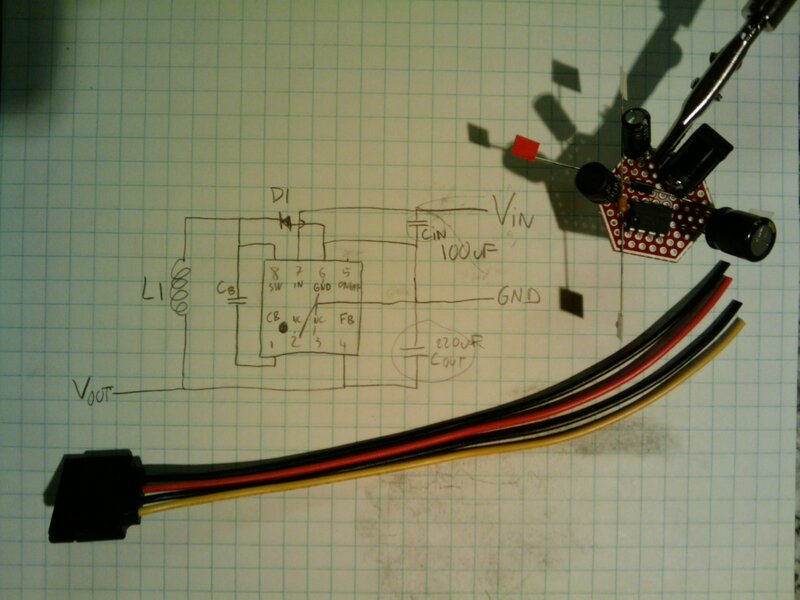 With these number in mind, I decided to design my converter for minimum 1A @ 5V. $0.95 - Sparkfun ProtoBoard, hex shape. Sparkfun is the only vendor I ever found who offers sub $1 prototyping boards with about this amount of board space. If you know others, please share links. This board is not quite the standard 0.1" hole pitch PCB, but all odd and all even rows independently follow this pitch so that it is possible to solder DIP8 packages. $0.80 - 2.1mm power jack connector, through-hole, narrow pins. The narrow pins allow it to be soldered on a 0.1" PCB when bent a little. 2.1mm makes it compatible with most docking station wall adapters. The other common inner diameter is 2.5mm. $4.48 - National Semiconductor LM2675N-5.0. $0.32 - .01uF ceramic capacitor. Used as the boost capacitor. $1.13 - 39uH inductor, 1.5A. $0.54 - 220uF aluminum capacitor. Used as the output capacitor. $0.30 - 100uF aluminum capacitor. Used as the input capacitor. $0.54 - 20V 1A Schottky diode. 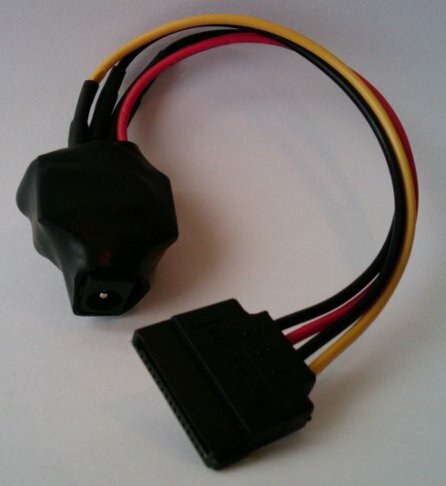 The current design requires a 12V wall adapter because this 12V input is output directly to the drive. 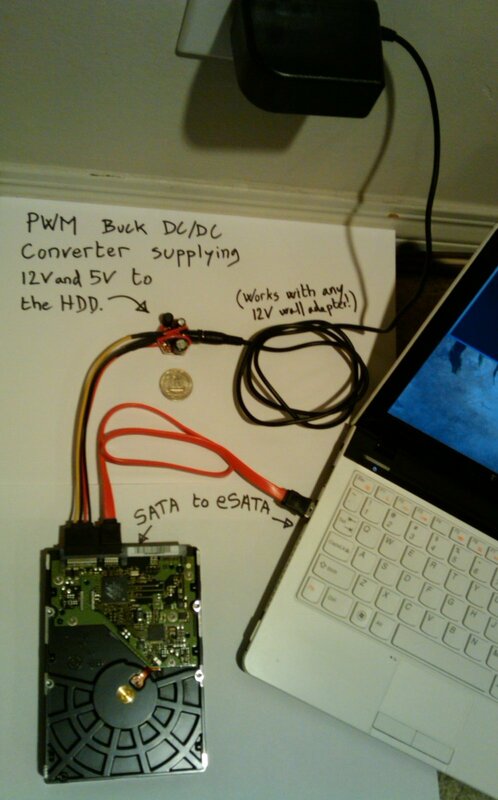 One could add another DC/DC conversion step (at the cost of increased board size) to regulate 12V, thereby making the SATA power module compatible with a wider range of input voltages, such as a laptop power adapter. One less adapter to travel with! I would be very happy to see a commercial product like mine. I found only one on Newegg but it is still too bulky and clumsy to my taste (separate thick IEC power cord, brick adapter, 4-pin molex power cable, 4-pin molex to SATA power adapter). sr wrote: Great article! Thanks! 1.5Gbps is a bottleneck for SSDs, right? not spinning harddrives, yet? For example my docking station uses the JMicron JMB20336. It is in theory capable of SATA 3Gbps according to the bridge chip datasheet, but I see it negotiate speeds of only 1.5Gbps with my laptop which supports 3G. On Linux, the SATA speed negotiated by a device is usually listed in the kernel messages (dmesg). JMicron has more detailled datasheets (but they are not available to the public), and I presume they state it supports 3G on the downlink, but not on the uplink. Of course the docking station is branded as "supporting 3Gbps". Sigh :-/ Or perhaps the bridge chip downgrades to 1.5Gbps due to EMI issues, poor traces, who knows? That's part of why I ditched my docking station, and others, after all. So I built my module and, ta-da, all the drives and laptops I have now work at 3G with a passive SATA cable. You are correct that 1.5Gbps is usually not a bottleneck with a single 7200 RPM HDD. However it is one when reading from the drive cache (which can mostly only be shown in synthetic benchmarks), as well as recent 15k RPM HDDs, SSDs, and also SATA port multipliers. sr wrote: Merci encore pour les infos. Will try to get the chip info. Needs also to test if esata hotplug has progressed. - "from the drive cache": ah yes, forgot this one. - "amount of time I spent researching a laptop that met my needs is worthy of another blog post " : yes, lots of laptops that are the same, but few features. Roger wrote: Parts from those supply houses get expensive when purchased one at a time and all the postage is added. Have you thought about putting together DIY kits and selling them for, say, 20% above cost? Many of us know how to solder or have a friend who does, we just don't have the patience to round up the individual parts. mrb wrote: Sorry I can't sell kits. Dude wrote: I need something like this, many thanks for the links to the parts mrb. Does your sata to esata cable have the required extra shielding of an external interconnect? Perhaps you are not too concerned if it is just for testing purposes. From the External Serial ATA White Paper. mrb wrote: The SATA to eSATA cable in the picture does not seem to have this extra shielding. But I have a few other cables that have it. Great build you've put together here. Do you have an email I can grab you on? I have a few questions i'd love to send your way. Joerg wrote: Good stuff, thank you! I would like to build a NAS using the marsboard. I am thinking of building a similar rig to power a 3.5" drive. It would be great if I could also throw in a USB supply to also power the marsboard itself from the same plug. NetScalerTrainer wrote: @Gyuri could you post your final design? What bypass capacitor did you use? Could you make me one of these? @Marc I think my drive is not getting power, I want to power it externally with one of these to double check. I have a MOLEX 4-pin to SATA power cable but that would require firing up another PC just to provide power and I have little space. Awesome build! Could you please upload a schematic and if possible, show where all the wires go? I'm a noob at this and would love some help.